I've been told my drawings are dark, even angry. I don't really see it myself. However, I have had someone watch me draw and then say, "You seem so sweet....but you're so AGGRESSIVE when you draw!" I am getting closer and closer to a good likeness of Taheerah. And, yet, I still am not there. I have drawn her many times. She has a wonderful presence. A sense of dignity. "My models, my human figures, are never like extras in an interior. They are the main theme of my work. I depend absolutely on my model." Flip has very angular features. She is fun to draw. Very difficult to get a true likeness. Not the best likeness of Xochitl. But, I hope it works as a drawing. This was a ten minute pose, if I remember correctly. The model dressed up in a wolf costume. This is charcoal on printer paper. You can see the crumples here and there. Not the best paper. Taheerah is one of my favorite models. This is charcoal and conte on Kraft paper. Charcoal on legal sized printer paper. Charcoal and pastel on Kraft paper. Now that I look at it, I'm not too sure about that ear! Charcoal and pastel on blue paper. Drea has the longest neck ever. I know it's a cliche, but her neck really is swan-like. She is one of the most graceful models I know. Such a pleasure to draw her. This is charcoal and pastel on Kraft paper. This is the closest I have come yet to getting a likeness of Flip. She is very thin, altho not anorexic. She has an exotic quality, similar to Cher (before Cher became addicted to plastic surgery and took on the appearance of a droid). This is charcoal and pastel on Kraft paper. Shelly has luxuriant red hair. Her most striking feature. Yes, owl is her real name. Here is Brianne, in charcoal and pastel. This is my best likeness yet of Katy. Claire's face is long, angular and expressive. I still have not captured her likeness, but I hope I have shown her beauty. This is charcoal, pastel and charcoal pencil on legal size printer paper. 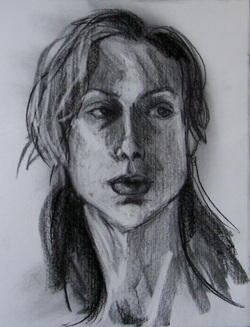 Below, Cassandra, in charcoal, pastel and oil pastel on Kraft paper. I love the color of Kraft paper. Katy is a wonderful model with a very interesting face. Charcoal, light charcoal wash, and erasure for highlights. I drew Katy, to the right, with red-rimmed eyes. As I write this, I think of a friend died last week. A young man of 24. A senseless motorcycle accident. A tragic loss of a sweet, wonderful person. I drew Katy as tho she had been crying. I'm getting closer and closer to an actual likeness of Cassandra. Charcoal, charcoal pencil and red watercolor pencil (not wetted) on copy paper. Kelli has large, soulful eyes. David T., in repose. Charcoal and charcoal pencil on paper. 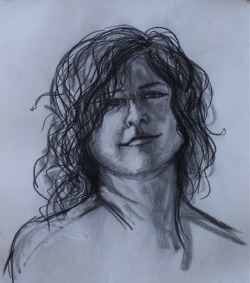 Senalka, charcoal and pastel on paper. Senalka combines strength and sweetness in a compelling well. She carries herself with dignity and grace. I love to draw her. Alas, she has moved away, to work on her Master's Degree. I hope artists there appreciate her as much as I do. This drawing is charcoal and pastel on thin chipboard, about the least archival paper there is, next to newsprint. As a general rule, the best drawings are done on the worst paper. The expensive papers intimidate us. The cheap paper gives us freedom. 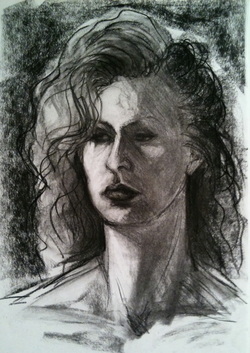 Here is Alix, another favorite model, in charcoal and pastel. I hope I have achieved somewhat of a patina effect. As does Senalka, he carries himself with grace, strength and dignity. Alas, he has moved away to work on his Master Degree in Sociology. We lose more good models that way! 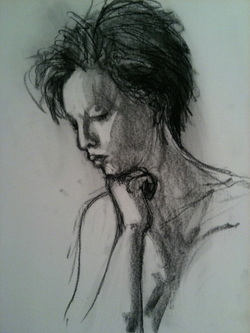 Chelsea, charcoal on paper. Chelsea has a rare ability. She can smile thru a half hour pose. Amazing. The Impressionists and Post-Impressionists portrayed the world of the Demi-Monde many times, no one more famously than Toulouse-Latrec. The scandalous women of the theater, of "the pleasure quarters". The outcasts, the marginalized, the "least of these." These burlesque performers remind us of that world, a world "polite society" pretended did not exist. Here in Austin, Texas, this is dress-up time, cheerfully earthy entertainment. They do not live the lives the women of Toulouse-Latrecs world did. But, that shadowy world still exists. And the "polite" still pretend it is not there, even tho they may visit it from time to time. 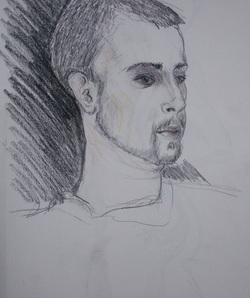 Jorge, pastel on paper. 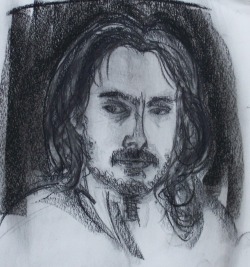 When I draw Jorge, he begins to look like Jesus to me, an effect I do not notice when in conversation. An actor, he has played Jesus, St. Francis of Assisi, and St. Anthony in various plays. I caught Leah in a thoughtful pose. Somehow, she reminds me of Judy Garland. Cassandra. Named for the Greek prophetess who forsaw with accuracy. But she only saw the bad news. So, no one would believe her. A drawing of my older son. We were in the waiting room at the doctor's office. I brought in my sketchbook. I think I worked on this one about 20 minutes. It was a better use of time than reading a magazine. 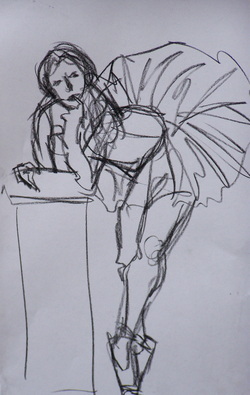 On the left, and below, two 2-minute sketches of a ballerina. This was at a Dr. Sketchy event. A burlesque ballerina. Who would have imagined? Both are charcoal on paper. I drew my younger son while he was asleep in a chair. Very sneaky. He never woke up. I think I worked on this one about 20 minutes as well. I see here how that line in the upper right, which I meant as the chair back, just looks like, well, a line. We all look back and see our mistakes. And, we learn from them.